In Dairyman, you are a dairy farmer, competing with your fellow farmers to see who can produce the most milk. Make cheese and ice cream along the way, and don’t let it spoil! Do we think Dairyman is a gouda game, or is it all jacked up? Read on to see if it hits a rocky road, or if it is the cream of the crop! 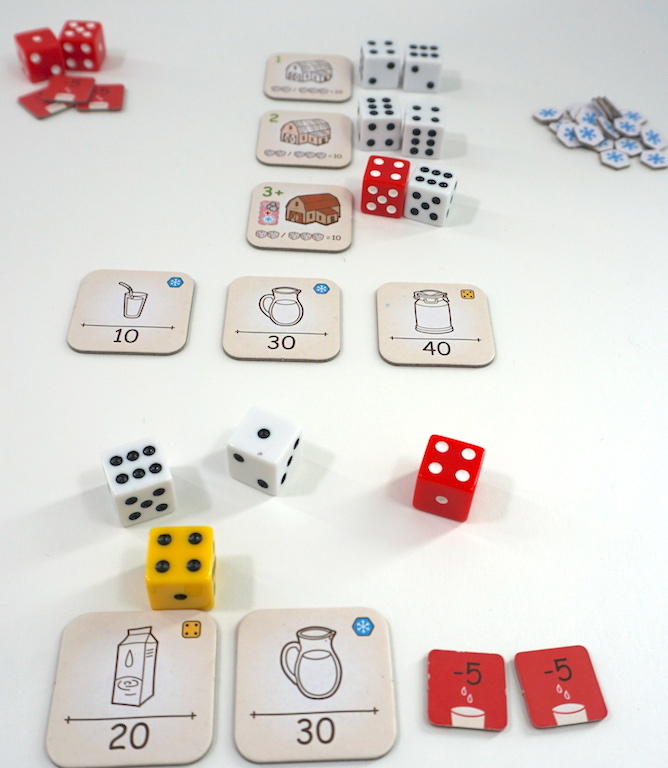 Dairyman is a press-your-luck, resource management dice game from Homosapiens Lab and Tasty Minstrel Games. Like most Tasty Minstrel offerings, it offers tight, strategic gameplay in a small box. Roll the dice. 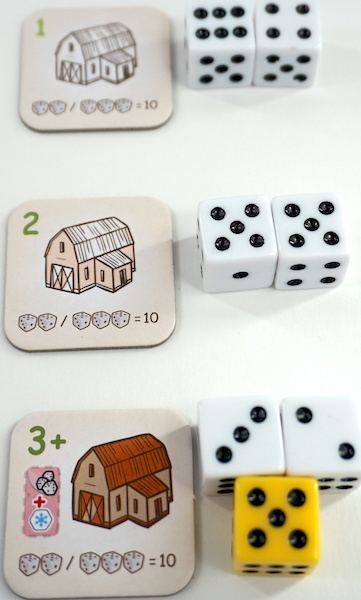 Make combinations of two or three dice that sum to 10, then “lock” those dice by placing them on a barn tile. If you have unlocked dice remaining, you may re-roll them or choose to stop. After re-rolling, you must lock at least one more set of dice, otherwise you “Fail to Produce Milk”. If you choose to stop, you may spend your dice sets to claim the Milk tiles from the available orders (priced at 10, 20, 30, or 40). You also “Fail to Produce Milk” if you are unable to claim any Milk tiles. 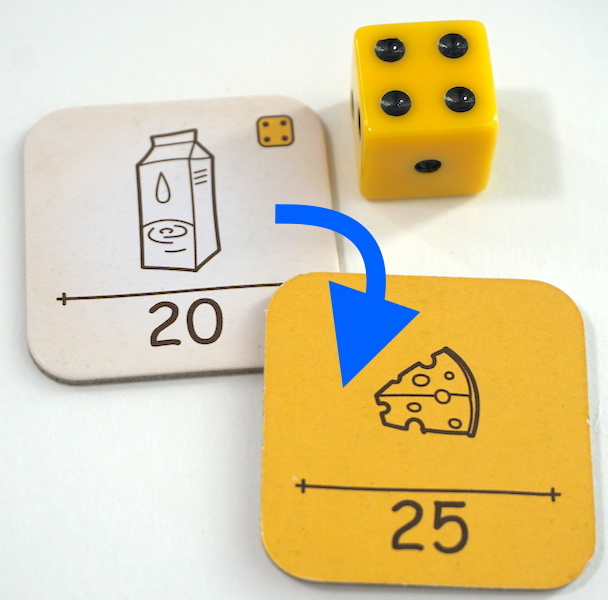 Use the yellow die in combination with other dice, or spend it to flip certain Milk tiles to become cheese. Cheese is more valuable than the milk it was made from, and cannot be taken away from you by “spoiling”. Continue to re-roll after locking at least twice, and you gain a freeze token. (Note: there is a slight misprint in the rules, stating you gain freeze tokens starting with “the third re-roll”. It should say the third roll.) Freeze tokens may either be used to “freeze” individual dice between re-rolls, or spent to turn Milk into ice cream. Ice cream is worth the same as the milk it was made from, but it gives a special ability that allows you to re-roll certain dice once per turn. Ice cream also cannot “spoil”. If you meet one of the failure conditions, you take a “backorder” token from the supply instead of claiming any Milk tiles. 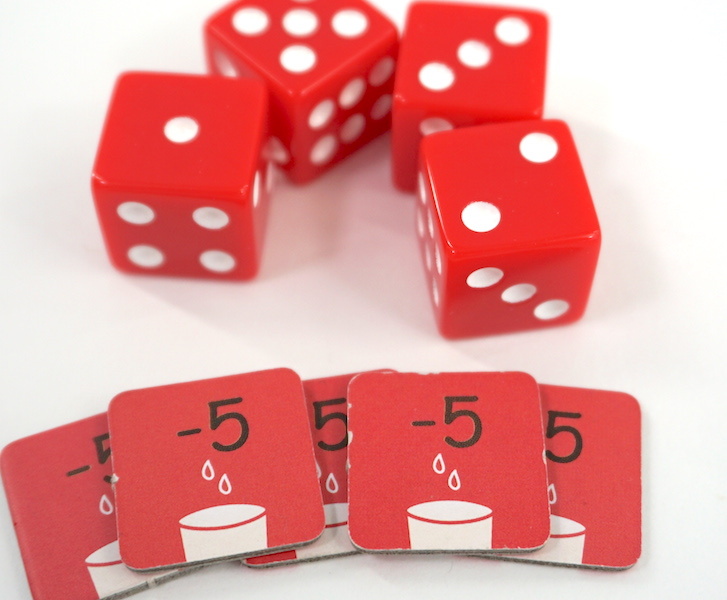 Backorder tokens are worth -5 points, but allow you to add an extra (red) die to your rolls. Red dice are treated the same as the standard white dice. 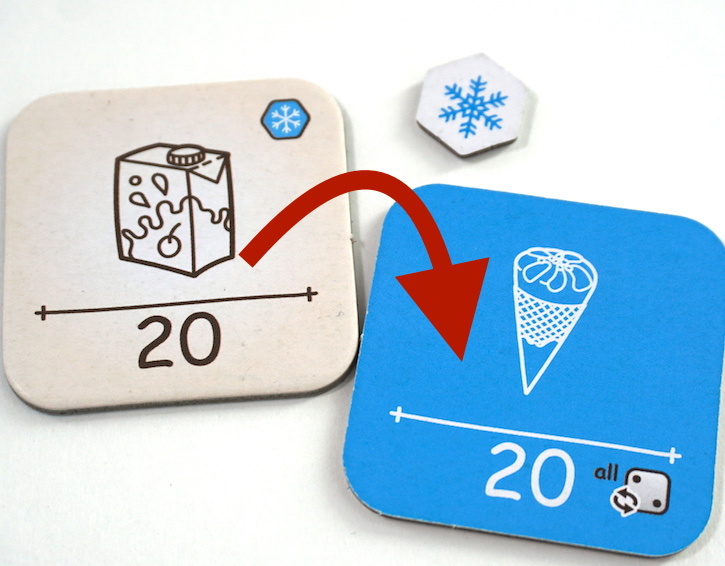 There’s a catch – when the last backorder token is taken, the player(s) with the most backorders must “spoil” their highest value Milk (but not cheese or ice cream), returning it to the stack. The currently available orders are also returned to the stack, which helps if all of the highest value tiles were out at the same time. Then all backorder tokens are also returned to the supply; the players who had them no longer have negative points, but they don’t have extra dice to roll, either. The game ends when there are not enough Milk tiles left to refill the available order display. Players add the values of all their Milk, cheese, and ice cream tokens, and subtract 5 points for any backorder token in front of them. The player with the most points wins! Dairyman has enough strategy to satisfy press-your-luck aficionados, adding some twists we had not seen before. The first time we played felt odd, since the rules make the game sound very competitive. There’s actually no direct player interaction, other than taking backorder tokens. It takes some time to get used to the strategy involved with the backorder tokens. Taking one (or two) makes rolling enough 10’s easier. If tokens are taken early in the game, it’s unlikely that they’ll still be around to give you negative points at the end. In fact, taking the most backorder tokens early in the game might not even hurt you, if you are consistently failing to produce milk anyway. When we played Dairyman with the kids, they got frustrated at first. It’s hard for them to understand the idea of using the backorder tokens to gain an advantage (more dice), but once they began to see that backorder tokens didn’t (usually) hurt, they were more willing to take risks sometimes. Playing with the kids, we discovered another feature of the game. For short attention spans, it’s easy to make the game faster by reducing the number of Milk tokens in the supply. Dairyman is a solid game that offers fun without being too cheesy. It doesn’t grip us with sharp, high-stakes gameplay, but instead lets us have a mellow experience. Like a strong cheese, it wasn’t our kids’ favorite, but it was a hit with the adults. It’s a strong but quick filler game we will return to again and again. The Family Gamers received a review copy of Dairyman from Tasty Minstrel Games.